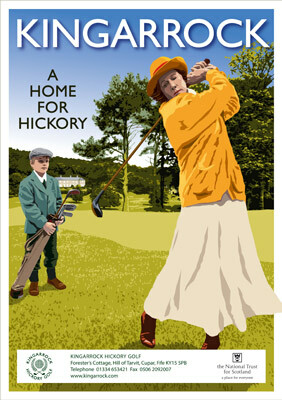 Just in time for the 2009 golfing season, Kingarrock Hickory Golf launched a marketing initiative to promote the game at Hill of Tarvit, Cupar. David Anderson, who has been responsible for the rebuilding of the 1920s course to its former glory in the last ten years, admits that until now the course had been a well-kept secret for local golfers. Now, he says, the secret is out and he wants to promote it to a wider audience, so, with the backing of the National Trust for Scotland who own Hill of Tarvit House, he asked me to create an image for the golf course, reminiscent of the railway tourism posters of the 1930s and 40s. 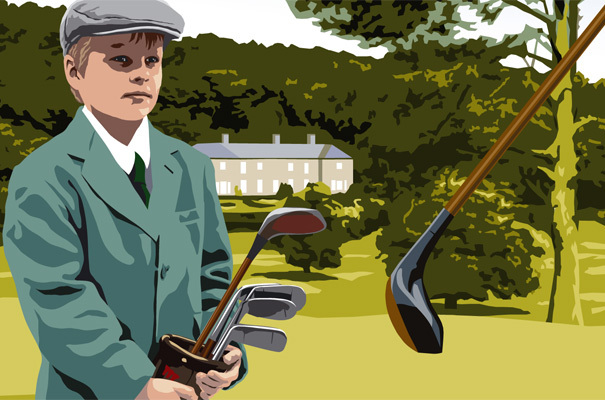 David’s grandson Ivan and friend Sylvia modelled in period golf attire for the illustration, while the view is from the 7th tee, showing the 6th green, with Hill of Tarvit House and the small cottage clubhouse in the background, amongst the trees. The final image, created entirely in Adobe Illustrator, has now been used throughout the club’s marketing, magazine advertising, posters, leaflets and postcards.